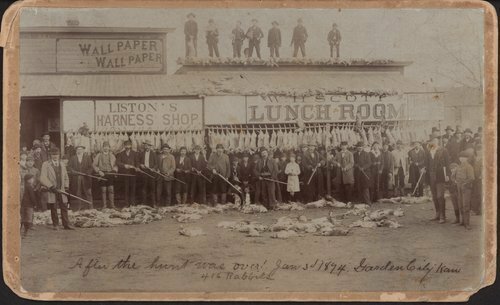 This sepia colored photograph shows hunters with their rifles and the carcasses of 416 rabbits from a hunt in Garden, City, Kansas. The group of men are standing in front of Liston's Harness Shop and W.H Scott's Lunchroom at the north-east corner of Chestnut and Main Streets across the street east of the Warren Hotel. Note the men and boys on the roof!